November brings cooler temperatures, great events, and Thanksgiving to Stockton, California. The holidays are upon us. There are so many things to do in November around Stockton, California with the entire family. Here are exciting activities to add to your calendar! Be the first to see the Stockton Kings open their inaugural season at the Stockton Arena against the Oklahoma City Blue on Friday, November 2 at 7pm. The whole family will experience NBA G League basketball action in Stockton, California, as Stockton Kings players captivate fans with a handful of dunks, alley-oops, and three-pointer scores on the court. Learn more. Immerse yourself in the Indian culture at the Annual Diwali Celebration on Saturday, November 3 which features an opportunity to experience the country’s cuisine, food, and music at Ronald E. McNair High School. Learn more. Salute Veterans in honor of Stockton Veterans Week. There will be several events peppered around the city paying tribute to American veterans and military personnel during the week of November 5 through 11. For more information about Stockton Veterans Week, visit StocktonVeteransWeek.com or follow the official Facebook event. Attend the Annual Hmong New Year Celebration on November 10-11, which will include presentations from speakers, a fashion show, cultural performances, talent shows, and other cultural traditions like ball tossing and food at the San Joaquin County Fairgrounds. Learn more. Take the kids to the Annual Trout Bout at Oak Grove Regional Park on Saturday, November 17. Over 1,000 lbs. of Rainbow Trout, including trophy-size fish, will be planted for the tournament featuring both youth and adult competitions, food, and prizes for the top anglers. Learn more. Experience unique works of art of more than 30 professional artists at the Annual San Joaquin Potters Guild Fine Arts Festival at St. Basil’s Greek Orthodox Church on November 16-17. You will see and you can purchase a wide range of media from ceramics, sculptures, glass, and fiber artwork. Learn more. Embrace the holiday season at Hospice of San Joaquin's annual "Tree of Lights” ceremony, held on the Tuesday, November 20. This unique community event offers everyone an opportunity to gather and reflect in order to honor and remember their loved ones who have passed. You can even purchase "lights" in memory of a special person and a ceremony featuring music is held to celebrate the official lighting of the "Tree of Lights." Memory boards list the names of those recognized on a marquee at the base of the tree is on view through Dec. 31. Learn more. 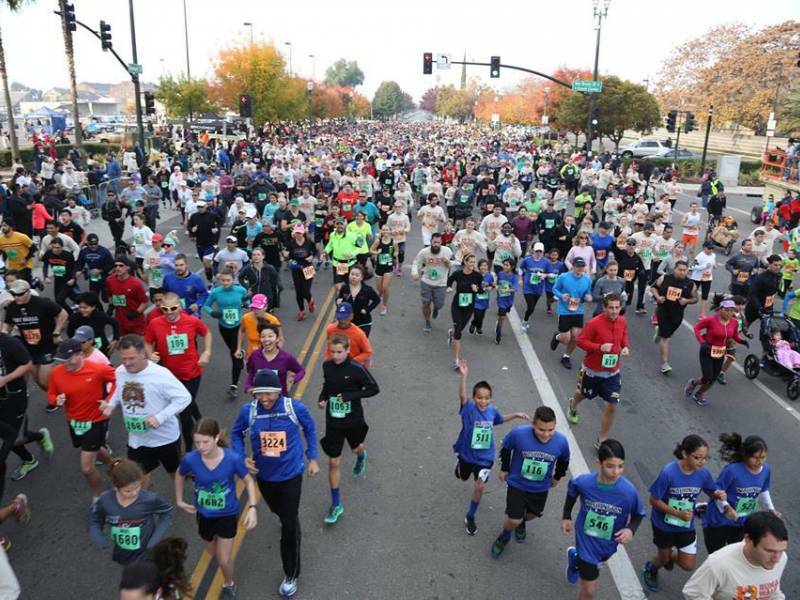 Race around downtown Stockton, while you embrace the colors of the fall season, at Weber Point Events Center on November 22, Thanksgiving morning. Join over 4,000 runners and walkers for the annual Run & Walk Against Hunger, benefiting the Emergency Food Bank of Stockton/San Joaquin. Your kiddos will will appreciate the 1/4 mile run, which starts at 8am, while the 5K and 10K run/walk begin at 8:30am sharp! Learn more. Every first Friday, Saturday and Sunday in November, the Sandhill Crane Festival features 48 tours, with bus transport to many locations in the Lodi region. Admission to the festival is free, but donations are graciously accepted. Need more recommendations throughout Stockton? You can text us 7 days a week, 8am to 8pm at (877) 778-6258 and you'll receive a live response from a member of our team. Discover something to do in Stockton every day of the year by checking out our events calendar today!